Sixteen Months in Dominica: Delicious food and frustrating deals. Yesterday Denise and I made an all-locally made meal, quite by accident. We had picked up a pumpkin at the market last Saturday, and we were told to simply gut it, boil it and mash it. Denise added some chicken stock to boot. Meanwhile, I made guacamole with an aging avocado, half a lime, some fried garlic and a diced tomato. 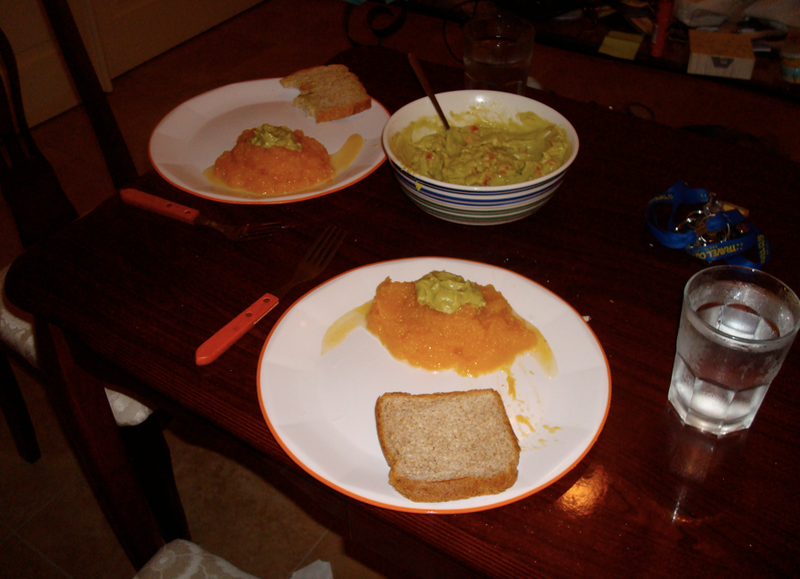 So we put the guacamole on top of the pumpkin mash, with a piece of bread. Holy balls it was good. If anyone ever has a chance to make mashed pumpkin with chicken stock, do it. It will blow your mind. Thus far the food here, when we can get it, has been phenomenal. Everything is organic (also known as regular food here) and grown nearby, and is generally super cheap. Some things are hard to find, and food goes very fast (we bought some tomatoes on Saturday and put them in the fridge. By Friday they were rotten). One of the difficulties we've had thus far has been price adjusting. The locals here are blatant in offering different prices to Ross students and spouses. It's getting very frustrating, having to constantly be on the lookout for stores jacking up the price, often by 25-50%. Case in point: Someone I work with, who is black and from Tennessee, got a whole bunch of food at a local market, and the clerk gave him local price until he opened his mouth. When his southern drawl came out, they literally jacked up the price in front of him. He now refuses to return. I think it really comes down to the principle. Even with the inflated prices, most things here are still cheaper than in North America. It's nonetheless frustrating because it's so damned blatant.